Up until now our most powerful car on the Dynapack has been the car which we sponsor, the Diemax Motorsport Toyota Soarer piloted by Steven Donnelly. 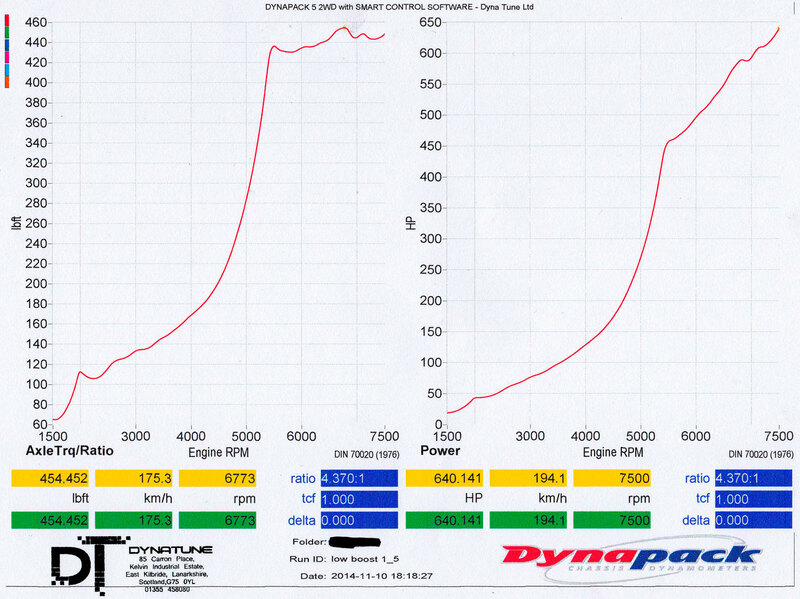 That was until now, we had a customer contact us through our Facebook page to ask us about a dyno run on their R32 Nissan Skyline GT-R which had been built in Japan. The customer had visited other tuners down south with his previous Skyline and when he bought his new one he continued to go to his known and trusted, that was until his son found us. It was booked in initially to give the car a once over, make sure it was all as it should be and that the tune was safe to run on UK fuels, a quick visual inspection found an extremely clean car! everything had been done to this car to an extremely high standard, the twin fuel pump set-up in the boot were a testament to this as they were made with hard lines which ran through to the front of the car. After warming up the car and dyno we done a base line boost run with the boost controller switched off, all went well and clean so we switched on the controller to low boost (1.5 bar) where it produced 640bhp at the hubs before a slight misfire caused us to abandon the run to tests the car further to find the cause of the miss. It was decided that a new set of coil packs would be a good starting point so the customer left and returned over a month later, new coils installed and ready to go. Again we started the warm up procedure the same way and again performed a base run on actuator pressure, this produced an exact duplicate of the previous time. It was then onto the real power runs, the boost controller was set to low boost and the sweep test began, this time the car ran clean all the way to the rev limit producing 687.5bhp at the hubs, that’s well over 700bhp at the flywheel! High boost was left for the summer for when the customer decides how he wants to take the car further next year.